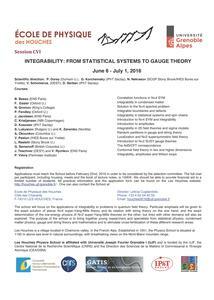 INTEGRABILITY: FROM STATISTICAL SYSTEMS TO GAUGE THEORY which will take place from June 6th to July 1st 2016. The main emphasis of the school will be on applications of integrability to supersymmetric gauge and string theory. 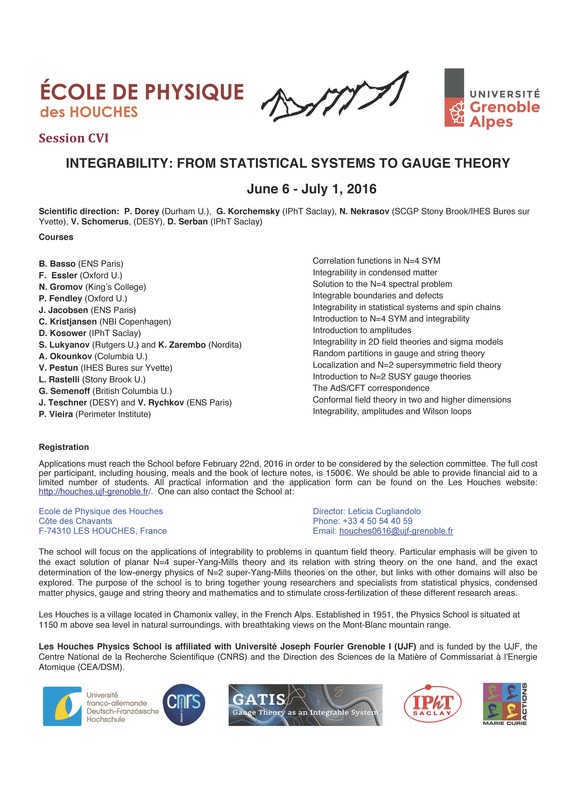 The purpose is to bring together young researchers with specialists from statistical physics, condensed matter physics, gauge and string theory and mathematics. We would like to provide the first with the necessary background for working in these rapidly evolving research fields, and to stimulate cross-fertilization of the different research areas. The school will last for four weeks, and the format is that of a few long courses of about 5 lectures of 1h30 each, as well as shorter courses of three lectures of 1h30 each. A few specialized seminars will be organized about the latest advances in the field. All practical information can be found on the Les Houches website: http://houches.ujf-grenoble.fr/. More information about the program will be posted on the web page of the school http://leshouches.strongcoupling.org/. The registration is already open and the registration form is available here. The organizers of the Les Houches school 2016 are P. Dorey, G. Korchemsky, N. Nekrasov, V. Schomerus, D. Serban.